Maiden results for a recently listed company are always fraught, particularly if you're the biggest tech IPO ever. What investors love in a tech IPO is a smooth magic carpet rise, a nice beat and raise which gives your stock that magical ingredients: earnings momentum. When earnings estimates are going up investors feel good because a) the stock can appreciate without requiring additional expansion in the valuation rating (e.g. the P/E ratio) and b) it gives a nice little buffer against that most unpleasant of surprises, a profits warning and an earnings downgrade (which in a tech stock is inevitably compounded by rating compression). Remember some basic psychology - investors hate looking stupid by getting a stock wrong. Much more, in fact, than missing out on a stock that goes up (which arguably is actually the greater sin). Which all helps explain why Facebook stock was down 10%, despite hitting consensus expectations for revenues and EPS (for the record, $1.18bn/12c respectively vs. consensus $1.16/11c). I've written before about how Facebook's valuation is still inking in pretty chunky revenue growth. The focus on the results conference call was all about how they are going to get there - in particular how they are going to raise their ARPU (average revenue per user) from a relatively measly $5 (and why it won't decline due to the impact of mobile. The chart below show's Facebook ARPU by region. As a whole the group saw a modest 5% sequential increase across the group. To frank though that's not enough. If the market is pricing in Facebook growing its revenues five-fold, a 5% pricing increase (even assuming it compounds to a 22% annual growth rate) won't cut it. What's Facebook's answer to the problem? Sponsored Stories. These are ads inserted directly into the newsfeed, rather than languishing (like an unwanted crumpet) on the sidebar. In fact it wasn't all doom and gloom on this front. The US actually saw a decent ARPU ramp of 10% (remember on an annualised basis that will compound to a mighty 48% growth) on the back on the introduction of sponsored stories (which drove a 20% ramp in price per ad). That's pretty impressive, especially given Facebook have been relatively cautious in rolling these out. If they can push this out globally (and users don't get to cheesed off by getting spammed with advertising in their newsfeed), then that could reignite ARPU growth. At least that's the story. However the other cloud hanging over ARPUs is Mobile. 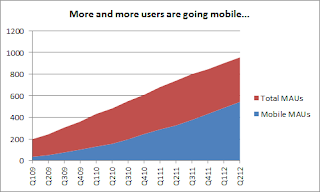 The second is that the shift to mobile is further diluting ad volumes. That's a toxic combination because it leaves Facebook depending on ARPU growth to drive overall revenue growth in its profit centres. The problem is that pricing growth is great, but its much harder and less sustainable than growing your installed base. There was also a second, less commented-on hit from Mobile on the Payments business. As I have written before, being early in Payments with Facebook Credits is a huge plus for them. A quick look at eBay's valuation (contrary to popular perception, investors see the company as a gigantic payments business (Paypal) with a bit of auction stuff bolted onto the back end) highlights why this is such a beautiful area to be in. That is so long as you don't get cut off at the knees. Payments revenues were roughly flat sequentially in Q2, a poor result for what should have been a growth area of the business - Facebook is way too reliant on the troubled Zygna here (which has been crushed by its mobile-related woes). It is interesting to note that while Facebook disclosed payments revenues by region in its IPO prospectus, it dropped this break-out in its Q2 results. Normally when a company changes its disclosure there's a reason here - I wonder if there's a Zygna-related clanger contained in that regional split (e.g. a significant fall in US payments revenue?). The problem Facebook has is that its payments platform isn't used on mobile. Instead people go via Google Wallet, or their carrier's native billing, or directly to card payments. The fundamental architectural issue is that Facebook is only an app on top of the mobile OS (Android or iOS) which in turn sits on top of the mobile network. So there are at least two other players (the OS operating and the carrier) which have a billing relationship with the customer below Facebook. This is why there has been so much discussion about a Facebook phone (which Zuckerberg pooh-poohed on the call) or having Facebook more deeply integrated into the OS layer (seen, albeit on the desktop, in this week's OSX Mountain Lion launch). 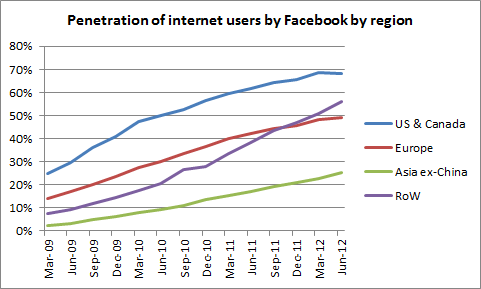 I reiterate, payments is a beautiful business and its a damn sight better for Facebook to be in it than not in it. But they face a real structural challenge getting it on the mobile. Less attention on the call was paid to user growth, which I think is a mistake. As I said above the surest way to drive sustainable revenue growth is by expanding your customer base, not just jacking. Increasing prices is like taking gold out of a mine you already own, but adding new users is like finding a new gold mine. 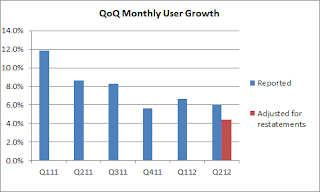 Facebook reported Monthly Average User growth of 6.0% sequentially, down from 6.6% last quarter and 8.7% a year ago. However note there's a funny in there - buried in the earnings slides is the admission that Facebook's previous assumption that user numbers were inflated by 5-6% (contained in page 36 of the IPO prospectus) was incorrect and the actual number is more like 3.9% (page 18 of last night's slide deck). If you adjust the historic comparables for the lower assumption (i.e. 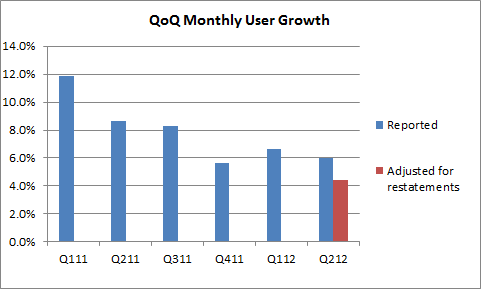 implying Q1 MAUs were 915m rather than 901m) this brings down the sequential growth rate from 6.0% to 4.4%. Before we get carried away let's have a reality check. "we don’t build services to make money; we make money to build better services"
This was one quarter where they key metrics were pointing down. 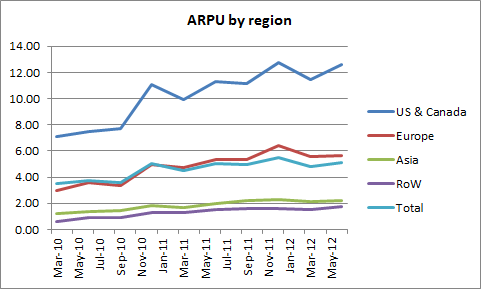 User growth and ARPU growth were sluggish. Costs were ramping up (a topic I don't have space to expand on here, but in short I don't think spending to grow is a mortal sin). 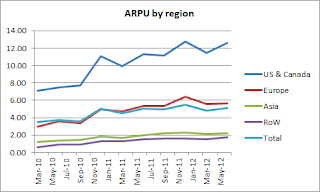 The one highlight was US ARPU growth, but Sponsored Stories remain a work-in-progress. (and we haven't even talked about European macro yet). Nonetheless I doubt these are capital offences. Real businesses don't provide a smooth magic-carpet ride on earnings. And arbitrating that volatility is one reason why tech is such a great space for the common stock investors. Nonetheless for the next few months at least Facebook is lacking that magic ingredient I talked about at the beginning. Earnings momentum.